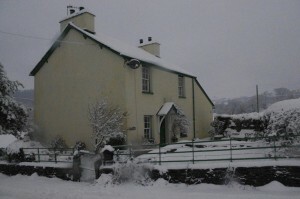 Ellis Howe is a luxury holiday cottage in the Lake District. It offers the perfect place to enjoy a traditional Christmas break in Cumbria. Ellis Howe offers Visit Britain 4 star self catering accommodation close to Coniston Water and is located in the hamlet of Torver, two miles from Coniston. It is secluded but not isolated and offers a peaceful alternative to the busier Lake District locations. Your Christmas cottage break at Ellis Howe will be a holiday to remember, with Christmas trees and decorations, and complimentary wine and chocolates. The Christmas holiday week dates are chosen to make Christmas Day the focus of your break. Built in the late 18th century, Ellis Howe has been tastefully renovated retaining many original features such as flagged floors, window shutters, meat hooks, original doors, window seats and ceiling beams. There are Laura Ashley furnishings and it is decorated with Farrow and Ball colours throughout. Ellis Howe is very comfortably furnished for five with double, twin and single bedrooms, all with luxury mattresses, duvets and quilts. Linen and towels are provided. There is also a cot, high chair and stair gate available if required. The tastefully appointed living room has the benefit of an AGA multifuel stove providing for cosy evenings in the wintry Christmas weather. There are night storage heaters in each room, and wall mounted heaters in each of the bedrooms, so no matter what the weather you can stay warm and snug inside! Fuel, electricity and heating are included at no extra cost. The cottage has a wide range of entertainments should the weather be inclement – LCD Smart TV/DVD, WiFi/Broadband, a range of DVDs and CDs, CD /radio, games, books, maps and guides. The kitchen is amply equipped for the Christmas cook- a cooker with ceramic hob, microwave, fridge freezer and dishwasher; however there is an excellent pub/restaurant within walking distance should you wish your Christmas day to be free from cooking! A spacious oak floored dining room offers superb views of Coniston Old Man and the surrounding peaks and fells. 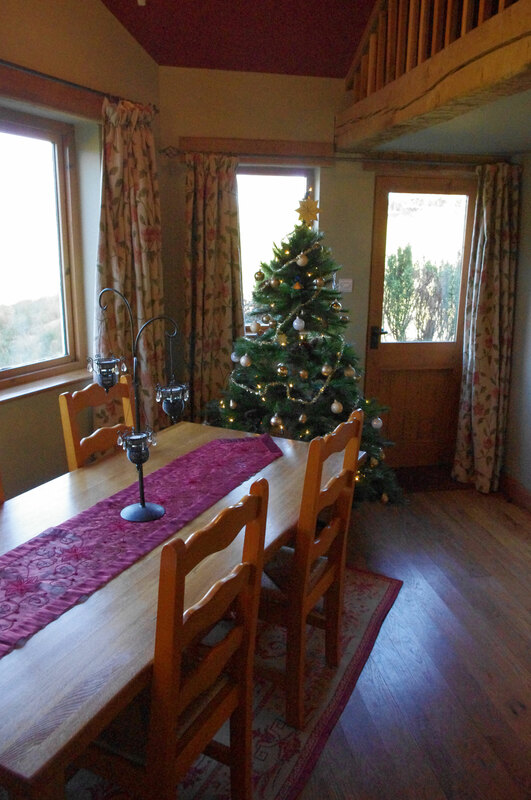 The large oak dining table and furniture provide ample room for the Christmas meal.This is a delightful place to view the changing weather on Coniston Old Man. A good covering of snow or even frost gives the scenery a magical look. The mezzanine area in the dining room is a favourite ‘den’ with children and a good place for them to play with the Christmas presents. The surrounding area has many low level walks to safely enjoy in the snow, including a short walk down to Coniston Water through the woods on Torver Common – a memorable walk on a frosty morning. There are many other walks in the area to challenge the most ardent fell walker and mountain biker. Torver , Coniston and Ambleside are close and thriving Cumbrian communities and there are many seasonal activities and celebrations that you will be welcome to take part in and enjoy. We’re confident that your luxury Christmas break at Ellis Howe will be a special memory for years to come. "We all love Ellis Howe and appreciate the trouble you take to make it so welcoming. It feels more like 'house-sitting' than 'self-catering holiday accommodation'. We all hope that you will let us come again!"